Happy New Year! It is already the third full week of January! Have you already started your New Year’s resolutions? A better question would be, have you already given up on your New Year’s Resolutions? According to a study on New Year’s resolution making , only 46% of people who made New Year’s resolutions actually stick to them by June! Changing eating and health habits are usually the top resolution and these are a little more difficult to keep. However, if you decided to be more organized in the New Year, you can actually accomplish this goal. Getting organized and reducing the amount of clutter in your home can be a daunting task. It can also be a project that you keep putting off, until you no longer have room to store new items. The biggest hurdle to an organization project is going through items and deciding what you need to keep and what you need to store, donate or throw away. We are emotionally attached to our belongings. For example, we might not have used a VCR in 10 years, but we still keep it around just in case! Once you are past the sorting step, the rest of the reorganization project is pretty easy. Here are a few simple tips to help you start off your year right by reorganizing and decluttering your home and keep it clutter free. 1. Create a goal for your project such as reorganizing the basement, cleaning out the overflowing hallway closet or organizing the garage, so you can park your car. You don’t need to decide to do your entire home at one time. Make smaller achievable goals for the project. 2. Develop a time line with a start and end date to complete each of the tasks within your overall project goal. Once you have completed the task, cross it off the list and move on the next. Crossing off items on the list is always a reason to celebrate! 3. Split up larger projects into smaller obtainable tasks, such as tackling the junk drawer in an office desk or going through a box of family heirlooms or photos. 4. When starting a reorganization project, completely clear out the area that you want to organize. Then, sort the items from the room (or junk drawer or shelving unit) into the following boxes: Keep, store, sell, done or throw away. You can purchase boxes and packing supplies for your organization project at your local Stop N Stor facility in Port Wentworth, Savannah and 3 locations in Hinesville. Self storage is a great solution when you have items that you just can’t part with. Stop N Stor has a variety of storage unit sizes from 5×5 to 10×30 that can hold all of your excess items. 5. Remove all of the items that are not going back in the room or area that you are organizing as soon as possible. Take the items to be donated or stored to your car to be taken to donation centers and your storage unit. 6. Does paper mail get stacked up all over your home? An easy anti-clutter tip is to sort your mail right away. Recycle your catalogs or magazines that you know that you will not read. Better yet, cancel the subscriptions to the magazines and catalogs and then you won’t have to worry about receiving them. Have a special storage bin for letters and bills that have to be addressed right away. 7. To keep your home clutter free going forward, have a storage spot for all of your items. Make sure to put these items in their proper spot every evening. This includes clearing off the kitchen counters, living room coffee tables and cleaning up and putting away children’s toys. A self storage unit is also a great place to put those items that you no longer have a specific spot for in room. Good luck with your organization resolutions projects! Stay tuned to the Stop N Stor Blog for future blog posts on decluttering and reorganization tips! Happy New Year! The holidays are over and it is now time to think about taking down the holiday decorations and storing them for next year. Most people store holiday items in a closet, basement, garage or attic. Store all of your holiday items together in an out-of-the-way space in your home or your self storage unit. Segregate your decorations into different boxes, such as all ornaments stored together, all lights or candles stored together. Also, it is a good idea to create a holiday decoration inventory list, so you know what you currently have and what you will need to purchase during the next holiday season. Consider placing your stored holiday decorations in a self storage unit. Seasonal items can be stored in the back of your storage unit and then switched out throughout the year. Stop N Stor has a variety of storage unit sizes that can meet all of your storage needs! Store holiday lights neatly coiled to keep them from being tangled. There are many great DIY solutions for storing holiday lights. You can make your own light storage reel out of cardboard. Cut out grooves along the top and sides of the cardboard. Place the plug part of the lights in one of the slots and then start winding the lights around. Other DIY ways to store holiday lights would be to wrap your Christmas lights around a coffee can or wrapping paper tube. A Christmas tree can take up a lot of space when you place it in storage. Store the tree in the original box if the box is in good condition. If that isn’t possible, take the tree apart and put the different branches in plastic bins for easy storage. There are also Christmas tree bag storage solutions that you can purchase. 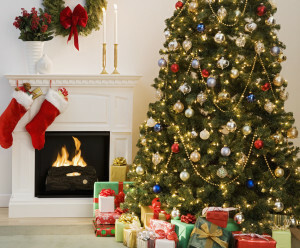 If you have the room, store the tree partial or fully assembled. Doing this makes it easier to put up the following holiday season. Store candles flat, out of direct light and in a fairly cool area. Sunlight can make the candles warp and lose their color. Wrap candles in cellophane to keep them from melting together. Place the wreath in the original box whenever possible and store it horizontally on a shelf. If you don’t have the original box, then place a bag over the wreath and hang it in a closet or behind a door. You can also use a garment bag to store your wreaths or larger holiday decorations. Do not store bags of wreaths on top of one another, as the wreaths could get damaged.